Please see the new Re-Envisioning Japan launched February 1, 2017. This new site is built on a more extensible and user-friendly Omeka platform. Please note that both the new Omeka site and its first WordPress iteration (2013-2016) coexist until we can migrate all content from WordPress to Omeka. We also continue to develop and refine the new site as we realize our plans for a deeper, more fully interactive and extensible project. This link will eventually re-direct to the new Omeka site. A comprehensive overview of the project’s conception and development, “Creative Curating: the Digital Archive as Argument,“ is included in Making Things and Drawing Boundaries: Experiments in the Digital Humanities (chapter 21), edited by Jentery Sayers and forthcoming September 2017 from the University of Minnesota Press as a special volume in the Debates in the Digital Humanities series. Thanks for your interest in this project. To date, nearly 10,000 unique users have accessed both the old and new Re-Envisioning Japan. You’ll find additional information relevant to the project on Facebook (ReEnvisioning Japan University of Rochester) and Twitter (Joanne Bernardi@ReEnvisionJapan). We will be featuring individual objects in the collection on the project’s new Instagram (reenvisioningjapan) page. On the first official day of spring (one month ago today), I thought that I would post about an appropriate object from the collection to commemorate the day. 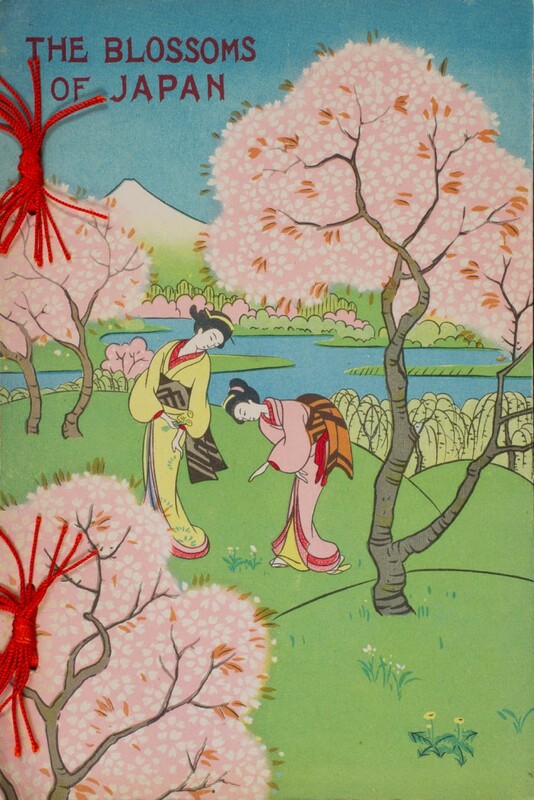 The small, softcover booklet with stab binding that you see below, The Blossoms of Japan (Japan Tourist Bureau, 1926), was issued by the Japan Government Railways and can be found in the General Culture gallery (Edification & Information–> Edification, Information & Instruction–> General Culture–> Item no. 1990). But before I could post it, it snowed (this is Rochester NY after all) and then snowed again and again, making the idea less meaningful. Yesterday I noticed early Japanese magnolias and budding cherry trees on campus, and although the famous cherry blossoms of Japan that grace this booklet’s cover have come and gone there, it again seems appropriate to commemorate the season, even at this late date. Spring brings about thoughts of new beginnings, so I am combining this seasonal celebration with news of new directions for this project. The deed of gift for the Re-Envisioning Japan Research Collection to transition to the stewardship of the River Campus Libraries Department of Rare Books, Special Collections, and Preservation (University of Rochester) is now official. This will facilitate enriched metadata for objects in the collection, make them more accessible to a broader audience, and guarantee their conservation. It is the perfect home for the collection because the library has given this project life and meaning, from taking on the job of digitizing the wide range of media in the collection, to hosting and sustaining the digital archive on its server. I will have (temporarily I am sure) a less cluttered home office again, and even better, the dining room will revert back to its original function after housing the films in the REJ collection for longer than I’d like to admit. Since September, the core REJ team (me, Nora Dimmock, Josh Romphf, and Lisa Wright) have been working with Kyle Parry (CLIR Postdoctoral Fellow in Data Curation for Visual and Material Culture), three Andrew W. Mellon Fellows in the Digital Humanities (Eric Loy, Chris Patrello, and Serenity Sutherland, Ph.D. candidates in English, Visual and Cultural Studies, and History respectively), and Joe Easterly (Digital Humanities Librarian) to design a new Omeka interface for the REJ digital archive. The new site will be more user-friendly and extensible compared to the current WordPress site, and it will allow the project to grow in directions that were limited or inhibited altogether by the current platform. The Omeka content management platform offers several advantages over the current WordPress architecture in that is built on a robust and extensible metadata-driven framework, and it will enable us to better expose the scholarship inherent in the curatorial process. It will also allow us to position REJ so that it contributes to the larger global research ecosystem that is rapidly being defined by projects like the Digital Public Library of America (DPLA) and the Advanced Research Consortium’s catalogue. I am most excited about our plans for an open-access, web-based publishing platform that will promote multimodal digital scholarship across disciplines and encourage re-use of the REJ digital archive (and, by extension, the physical collection). This publishing platform will focus on object-based scholarship and pedagogy. Its working title, Routes, is inspired by James Clifford’s 1997 eponymous book about the complexities of cultural mobility and cultural encounters in the modern world. In this context, “routes” is meant to suggest the circulation of objects, of trade, and of pathways through collections and websites. The first issue will focus on projects using the REJ collection. You can read more about these developments here, in a paper that I gave at Syracuse University on April 1, 2016, as a guest of the Department of Languages, Literatures, and Linguistics. Announcing plans for Routes gives me the opportunity to commemorate another important moment, Earth Day. 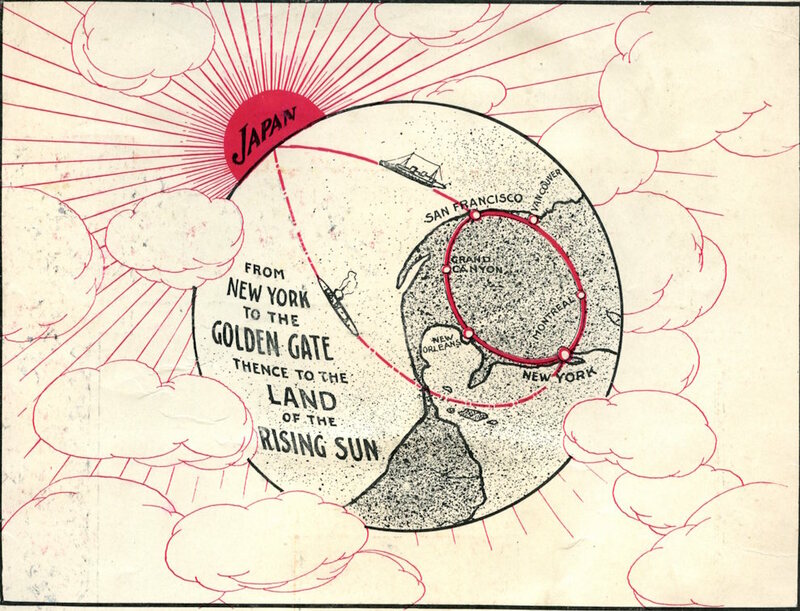 This image is from an ad for tours to Japan, found in the archives of the Japan Society, NY. Thanks to Cynthia Sternau for this wonderful image. [Murakami’s] “connoisseurship” is not based on buying up canonical pieces, but more akin to the wanderings of Wall-E, picking through the artefacts of modern life, hoping that if enough data is amassed it may be possible to better understand the human condition. . . .The stated purpose of the show is to bring up big issues; “What is art?,” “How is the value of art determined?” and “What is a collection? Murakami replies with a parable: “There is a very strange guy, Sakata-san, who runs an antique shop in the Mejiro district. When I say ‘strange,’ I mean he’s a genius, because he finds new meaning and new beauty (in things). In the last 100 years the Japanese idea of beauty comes from rich people, like, for example, Muneyoshi Yanagi who founded the mingei (folk art) movement: He found Korean craft objects and chose — this is good, this is not good. So, the answer to the question “What is not art?,” I ask, is not thinking, not processing? “Tourist Japan” has been a venue for working through my ideas while building and studying the physical collection. The course evolved as I began to think more critically about digital humanities practice and material culture; I significantly redesigned the syllabus for the Spring 2015 semester. I taught the course as a digital humanities lab for the first time in Spring 2014, adding hands-on class sessions on developing metadata (logistics as well as the philosophical issue that inevitably arise in their creation) and digital curation. Students use Omeka as a platform to create their own exhibits using objects from the Re-Envisioning Japan collection, at both the midpoint of the semester (divided into small groups as an introduction to the collaborative dimension of DH practice) and at the end, when they work on individual projects. As Michael Roy points out (“Either/Or? Both/And” Difficult Distinction within the Digital Humanities,” Educause Review, May-June 2014, 16-20), in digital humanities, distinctions between teaching and research are often blurred. Roy explains how students can “become co-investigators on humanities-focused questions, doing meaningful work on large, complicated research projects.” There is a productive, reciprocal relationship between my digital scholarship and my teaching. Integrating the Re-Envisioning Japan digital archive into the classroom experience has been a natural extension of the act of researching these objects and the life and times of the people who made and used them. I gain fresh perspectives from student insight and students have access to unconventional but deeply resonant and informative primary source material. The archive and the collection become important tools that complement secondary reading assignments and films that are both screened in class and designated as part of their weekly assignments. This hybrid model of teaching opens up opportunities for new directions in the critical analysis of these objects and the world they reflect. Item of the day, to commemorate the new year 2016 and REJ Team member Serenity Sutherland‘s first trip to Japan, which included a stay at the historic Fujiya Hotel, located at Miyanoshita Onsen, a hot springs in Hakone, in Kanagawa prefecture. Established in 1878, this is one of the oldest establishments to cater to foreign tourists; the main building dates back to 1891 (it survived the Great Kanto Earthquake of 1923). This card (left) is the first in a set of twelve beautifully illustrated cards, one for each month of the year. The illustrations depict festivities associated with each month, and descriptions for the illustrations appear on the back of each card. 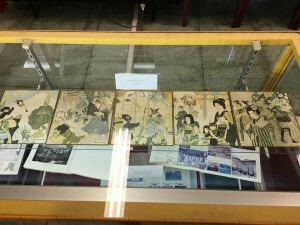 All twelve illustrations are inscribed “Fujiya Hotel, Miyanoshita, Japan.” The photo below shows the set as displayed at the hotel’s museum today (compliments of Serenity Sutherland). This set of cards and many other objects associated with the hotel can be found under the “Hotels” gallery (Tourism & Travel). There are additional items in the collection that have not yet been added online, including the books on Japanese culture published by the hotel’s founder, Yamaguchi Sennosuke, between 1934-1949. An ad for a bound copy of the compiled volumes, published under the title We Japanese, can be found here. Glass lantern slides depicting nearby Hakone Lake, at the foot of Mt. Fuji, and Fujiya Hotel can be found in the Leisure & Entertainment gallery under “Photography” (no. 3053 and no. 3057), as well as photographs of Hakone (no. 2016, 2017). You can get an even more immediate sense of the hotel in its prewar heyday by watching the 16mm archival film Japan as Seen from a Rickshaw, which is accessible on this site under “Moving Images,” courtesy of the George Eastman Museum. This amateur travel film, shot by a member of the Amateur Cinema League, dates from 1930-1931 and contains shots of the hotel’s exterior, interior, and beautiful gardens. It was accessioned by the Moving Image Department of the museum in 1989 but the filmmaker is unknown. There are other films in the museum’s collection that were accessioned together with this film, and were presumably made by this same person. They all feature the same title card, “Jeanne Films,” but it is not clear that this refers to the filmmaker’s own name. Promoting Japan as a tourist destination has been on the upswing as the nation prepares for the 2020 Olympics. 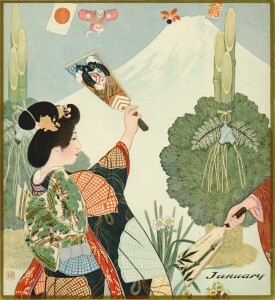 From January 9 to February 28, The National Museum of Modern Art, Tokyo is featuring an exhibit of posters, pictorial magazines and brochures from the 1920s-1930s inviting tourists to enjoy the landscape and customs of Japan. As is the case for much of the material on this site, these items are remarkable evidence of the first systematic government-sponsored campaign to promote Japan as a sightseeing destination for foreign tourists. 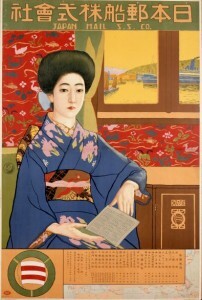 Many of the posters in the National Museum of Modern Art exhibit feature illustrations by well-known contemporary artists, including (in Japanese name order of surname, first name) Sugiura Hisui (1876-1965), Takehisa Yumeji (1884-1934), Yoshida Hatsusaburo (1884-1955) and Satomi Munetsugu (1904-1996). Here are a few of the items in the exhibit that accompany the brief announcement of the exhibit on the museum’s website, accessed today (29 Dec. 2015). 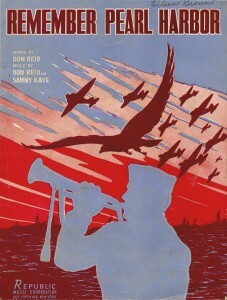 You can now listen to recordings for 35 items in the Sheet Music and Wartime Propaganda (US, UK) galleries. The recordings were made earlier this year under the direction of Philip C. Carli (piano), with Soloists Isaac Wenger, Lulu Cossich, and Peter Doyle, and (Ensemble) Matthew Adrian, Isaac Assor, Alice Carli, Hannah Kurth, and Cody Muller. Recording Engineer David Dusman, Dusman Audio, Inc., provided the recordings, optimized for presentation here by Joshua Romphf, Digital Humanities Programmer at the Digital Humanities Center, University of Rochester. 46 songs in all were recorded, and the remaining songs will be made available as we receive them from Dusman Audio. 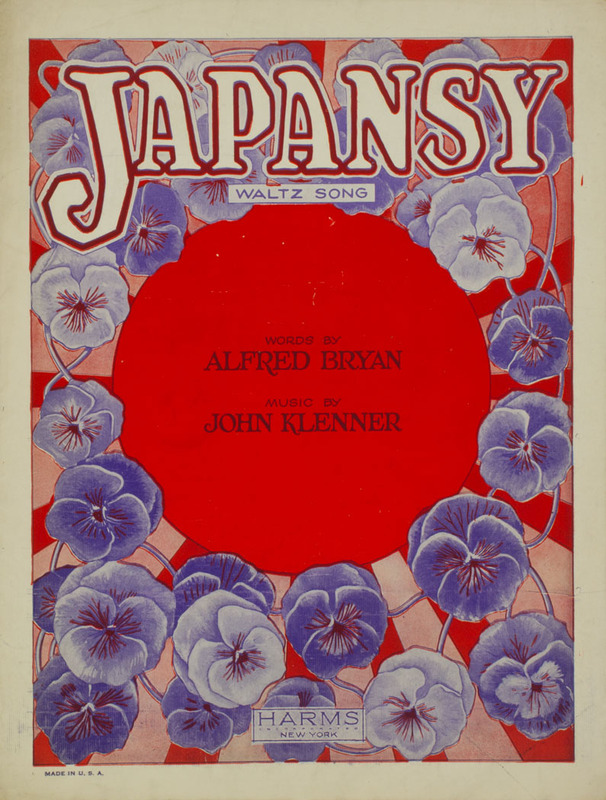 The earliest sheet music in the collection is The Mikado: Gems on Airs from Gilbert & Sullivan’s Opera (for piano and vocal), published in New York in 1885. This item was collected after the recording session earlier this year, so a recording is not available here, but more recording sessions are possible in the future. The Mikado: Gems on Airs was published the same year that the iconic comic opera by Arthur Sullivan and W.S. Gilbert opened at the Savoy Theatre in London, where it ran for 672 performances. It is difficult to rein in the vast Mikado universe, even within the Re-Envisioning Japan collection. You will find a sample of the ways in which the opera’s profile was amplified through marketing merchandise, for example, in the Advertisements & Shopping gallery. The opera’s origins coincided with the 1885-1887 Japanese Exhibition in Knightsbridge, and you can peruse postcards from the diverse “Japanese Villages” throughout time in the “Japan in America” section of the Postcards gallery. Examples of such imaginary Japans represented in the collection range from The Japanese Village at Revere Beach, Wonderland Amusement Park, Massachusetts [1906-1911] to the Japanese Village and Deer Park in Buena Park, California (1967-1975). The most recent addition to the collection that can be linked to The Mikado is the late 1950s LP The Coolest Mikado, performed by The Gilbert and Sullivan Jazz Ensemble. The Coolest Mikado is not to be confused with The Cool Mikado, a 1962 British musical directed by Michael Winner set in contemporary Japan (a sound stage) or, for that matter, The Hot Mikado, a 1930s musical theater adaptation with an African-American cast. Just incidentally, The Hot Mikado was preceded by a WPA Federal Theatre Project production, The Swing Mikado (1938), and has its own progeny, Hot Mikado (1986). As you can see, The Mikado‘s footprint looms large in the world of popular “representations” of Japan (in quotes here because representing Japan was not really part of Gilbert and Sullivan’s original plan). 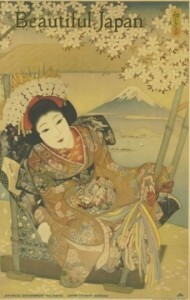 The University of Rochester has a significant collection of artifacts related to The Mikado, and items in Re-Envisioning Japan will augment this collection when stewardship of the REJ material collection transitions to the University’s Department of Rare Books, Special Collections, and Preservation. 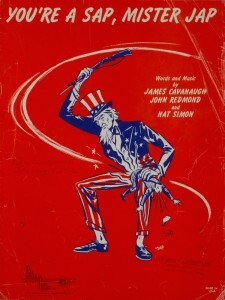 The most recent sheet music in the collection (1941-1945) is located in the Wartime Propaganda (US, UK) gallery, and is referred to in a previous post. nationalistic spirit of Japanese propaganda objects in the collection, especially because I’ve focused on things that feature patriotic women on the homefront. (John Dower‘s excellent study, War Without Mercy: Race and Power in the Pacific War, highlights the radical contrast between WWII era U.S. and Japanese propaganda.) Alas, current events evoke memories of WWII anti-Japanese racism in the U.S., most notably Roanoke Mayor David Bowers’ comparison between Roosevelt’s decision to “sequester Japanese foreign nationals” and the “threat” of Syrian immigration today. He later apologized, but I hear Donald Trump is planning a Pearl Harbor Day remembrance rally. I hope no one sings. Recordings of Yama-san (1902), Suki San (1917), When the Cherry Trees are Blooming in Japan (1918), and Poor Little Butterfly is a Fly Girl Now (1919) have been added to the Sheet Music gallery (the links will take you to the gallery page where these objects are located). 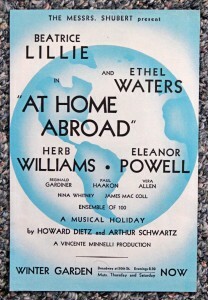 A couple of weeks ago my brother, who has an extensive knowledge of Broadway stage musicals, reminded me of song from our past, Get Yourself a Geisha, from the 1935 revue At Home Abroad (words & music by Howard Dietz and Arthur Schwartz, a Vincente Minnelli production, presented by the Schuberts). We discovered it on vinyl back in the late 1970s or early 1980s, on one of the wonderful Smithsonian albums of vintage recordings. I admit we played it regularly with much glee. It is as politically incorrect as the title implies, but it’s hard not to be gleeful when listening to the inimitable Beatrice Lillie, especially her refrain “Ho-ku-sai Hiroshika Hoku-sai!” (It is an earworm, be forewarned.) According to one review (Time, 30 September 1935, “The Theatre: New Plays in Manhattan”), the plot–such as it is–consists of a “musical holiday” taken by a couple “so bored with the ubiquitousness of such U.S. personages as John D. Rockefeller and Mrs. Franklin D. Roosevelt that they flee on a world tour . . . .” There are 25 musical numbers, mostly by Lillie but also by Ethel Waters (Hottentot Potentate, another remarkably culturally insensitive but effective earworm, Loadin’ Time, and The Steamboat Whistle). It also featured Eleanor Powell, Herb Williams, Eddie Foy, Jr. (“who can at least imitate a seal better than anyone else in the U.S. theatre”) and “British newcomer” Reginald Gardiner imitating trains, dirigibles, and steamships. I don’t know how this memory escaped me in building Re-Envisioning Japan, as the revue encapsulates the transglobal tourism boom of the mid-1930s that helped inspire this project. Then again, perhaps it planted a seed in my subconscious mind, dormant until now. Now I have the CD (original cast recording, Aei Records/Record Depot, 2006), a copy of the original playbill, and a handbill (left) appropriately illustrated. Thanks to this project, I am re-engaging with the song, and the musical, in a new light. made over the course of several sessions this past spring at the home of Philip C. Carli, pianist, film historian, popular culture scholar, and all-around Renaissance human. Dr. Carli is a familiar figure for silent film enthusiasts, renowned for both his live piano accompaniments all over the world and original scores for silent film screenings. Locally, he regularly introduces and performs for the silent film screenings at the Dryden Theater at George Eastman House International Museum of Photography and Film, where he also worked in the past as film archivist. For the vocals he assembled colleagues and graduate students at the Eastman School of Music, including soloists Isaac Wenger, Lulu Cossich, and Peter Doyle; additional vocals were provided by Matthew Adrian, Isaac Assor, Hannah Kurth, and Cody Muller. Dr. Carli’s wife, Alice Carli (complementary Renaissance human) performed also and coordinated everything, including preparing for the rehearsals by making more readable black and white copies of the 46 songs that were recorded. Recording Engineer David Dusman, of Dusman Audio, Inc., is still in the process of working on the recordings, but the following songs are now available to enjoy online: Poppy Time in Old Japan (1915); In Japan with Mi-Mo-San (1915); Midnight in Japan (1915), In Old Japan (1917); So Long Oo Long (1920, there are two versions on the site, so choose the first, item no. 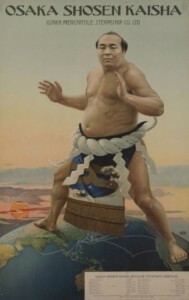 1873); and Japansy (1927). The songs are fascinating examples of the ways in which Japan and the Japanese were characterized by orientalist trends in early twentieth century popular music.